When running from a Windows 2003 server, JUpload displays the "evaluation version" message even though the license.id file is present in the folder. 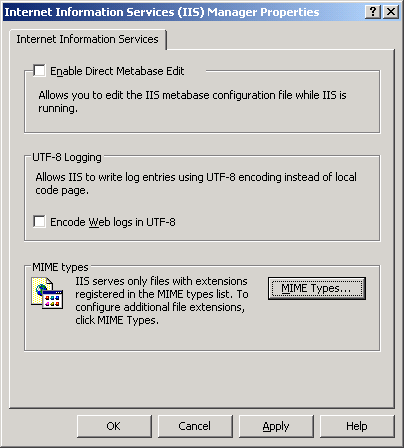 This occurs because IIS 6.0 by default will report a 404 Not Found error for file extensions that are not registered with a MIME type on the server. You must add an entry for .id files in IIS. Open the Computer Management applet and open Properties on Internet Information Services. Click on the "MIME Types" button. 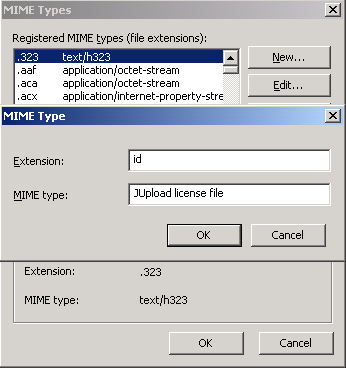 A window with a listing of MIME types will appear. Click on the "New..." button. Enter id for the extension, and a descriptive term for it such as "JUpload license file", as shown, and click OK.
You may need to restart IIS for these changes to take effect. You can verify that the file is now accessible, by entering the direct URL to the license.id file in your browser address bar.